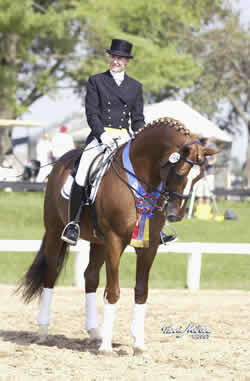 Karin Offield claimed her fourth FEI-level USDF Regional Championship this year aboard Tiamo Trocadero. Lexington, KYTo win a single USDF Regional Championship at the FEI levels is a great accomplishment for any adult amateur, but to add a fourth title to a string of championships is especially impressive. Karin Offield did just that by successfully defending her title as the Region Two Intermediaire-1 Adult Amateur Champion at the Great American/USDF Region Two Championship in Lexington, Kentucky. Offield rode her chestnut stallion Tiamo Trocadero to the victory. I was absolutely thrilled, Offield said. My stallion was wonderful and it was a lot of fun. The event was held at the Kentucky Horse Park, which provided it own level of excitement. The facility is a real showplace. Lexington is very, very fortunate to have such a facility. Simply being able to compete there was pretty exciting, she said. Like many amateurs, Offield must find time to for her training within a hectic schedule. Offield rides almost daily and also makes time for weight training and Pilates, which she feels have been invaluable to her riding. As an athlete I do everything possible to increase my level of performance,  Offield explained.